This week’s What’s Cooking Wednesday came about as a “What do we already have in the house?” dish. We had some cannellini beans that P’s mom had prepared for us (they were already soaked and cooked), and although we usually pair them with chicory, we wanted something different. So I searched the Internet and found this recipe for the traditional Florentine Fagioli all’Uccelletto, which calls for just tomatoes, garlic, olive oil, and sage in addition to the beans. Since I didn’t have any sage, I used basil instead. In fact, this has quickly become a staple for us–so quick and easy, and it sticks to your ribs too, especially when you pair it with fresh bread. If you want to use dry beans, please see instructions here for soaking and cooking before you add them. 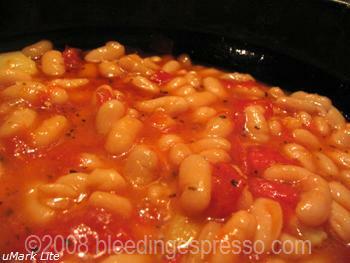 I tend to use canned beans because they keep their consistency a little better when mixed with tomatoes in particular. 1. In medium saucepan, heat olive oil over medium heat. 2. Add tomatoes, garlic, basil, and a bit of salt, and let cook for about 15-20 minutes, stirring often with a wooden spoon. You essentially want this to become a chunky sauce. Note that if you’re really against tomato skins in this, parboil the tomatoes first and remove the skins before adding them to the pan. 3. Stir in beans and let cook for another 10 minutes or so. Remember that the beans really only need to be heated through, so be sure the tomatoes are cooked to your liking before adding the beans; otherwise you’ll end up cooking the beans too long, and they’ll get mushy. 4. Adjust for salt and serve hot with crusty bread. Yum, this is one of my staples as well. it’s so easy and good. I use the canned beans too. The Umbrian version of fagioli agli uccelletti is no tomatoes and several herbs. Yummers, too. I start from dried because they are like 25% of the price of canned! I don’t really care if they look perfect, but the less they move around, the less broken they’ll be. That would be great camping food. Absolutely! P is fascinated by all those Westerns that show guys eating beans from cans over the fire…. Yum, they look so good. I usually add pancetta, like you say, the flavour blends in really well. I love fava beans…but cannellini are my fav. This recipe looks absolutely to die for!! Dory’s last blog post..Quiz time! I just tried this recipe from Apples For Jam…it was wonderful! Easy to make and it felt really healthy to eat it..
Ooh I’ve never heard of Apples for Jam; now I’m intrigued…. Tomatos, basil, garlic, and beans… this has got to be another winner! Sounds wonderful! BTW, I used the George Ella Lyon poem exercise in class this week, with great results. It’s the first exercise where my students have asked for extra copies of the template to try again at home. Thanks! Oh I’m so happy to hear the poem went over so well! Thrilled! Also maybe your carnivores would like this dish with some bacon…. Yum. I always have canned beans of many varieties on hand – such a staple. I’m a basil kind of girl so I would love your dish just the way you made it! Delicious!! That looks and sounds wonderful. I’ll have to try it. I hope you like it Devon! What a wonderful recipe! I can’t wait to try it. In these parts they add slices of sausage to this dish…ooh, yeah! Ooh and I just bought sausage today too! Mmmm…. Hope you enjoy it Paz! I often mix the beans too…never have sage around though, but it sounds great!